After a lengthy and passionate campaign, mum Kyra Williams has finally got what she so badly wanted - improved disabled changing facilities for her daughter Molly. Kyra was featured in the Mail back in March last year, claiming that the facilities at Harborough Leisure Centre were the worst she had ever come across. She had to shower her daughter Molly while she was lying on the disabled changing room floor. But after years of letters and a year-long social media campaign, the Harborough District Leisure Trust has now refurbished the changing facilities for disabled people at the Harborough Leisure Centre pool - the main change being the installation of a £3,000 hoist in the disabled changing room. A spokesperson for the trust said: “After being informed of the feedback and campaign building around it, the Harborough District Leisure Trust, which runs the leisure centre, sat down with Kyra to see what could be done. “The trust had been assured that its facilities complied with necessary guidelines, but Kyra’s feedback resulted in a consultation and a series of changes being suggested. Trust chair Clive Grafton Reed said: “The ‘Harborough Hoist’ is now up and running along with the electric shower bed, and is already proving itself a worthwhile addition to the centre’s facilities. 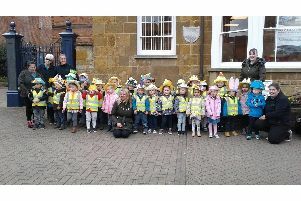 Harborough District Councillor Barbara Johnson, who is the ward councillor for the family, got involved last year after describing the previous facilities as “outrageous”. She said: “I’m pleased that facilities are now appropriate and no longer present challenges for the children and those accompanying them.